Ideal for more athletic builds, the Anvil 6750 Triblend T-Shirt is the perfect balance of the three major fabrics used in high-end shirt production for paramount softness of hand. Ring-spun cotton yarn is made by continuously twisting and thinning the fibers, which makes the short hairs of cotton stick up, resulting in a stronger yarn with significant softness. Rayon imitates finer natural fibers, but is more durable. 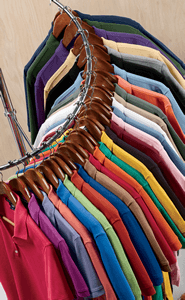 Polyester is the workhorse of the fabric, supplying extreme strength, colorfastness, and shape retention. Polyester also dries quickly, making this shirt versatile for varying activity levels. This undemanding shirt is semi-fitted in the upper torso and sleeves, and well-sized at the waist, so you can wear it any way you like. Side seam construction and double-needle sleeves and bottom hem make for a well-built shirt that is ready to receive any print or embroidery designs you wish to add.